Count Hubert James Marcel Taffin de Givenchy, fancy french aristocrat and founder of the House of Givenchy, has died at 91, reports WWD. Givenchy founded the house of Givenchy in 1952, but it was that little black dress he designed for Audrey Hepburn to wear in the opening credits of Breakfast at Tiffany’s that firmly established his place as the go-to designer for a casual yet studied elegance—dressing like a French woman before lifestyle blogs urged you to buy red lipstick and drink more wine. 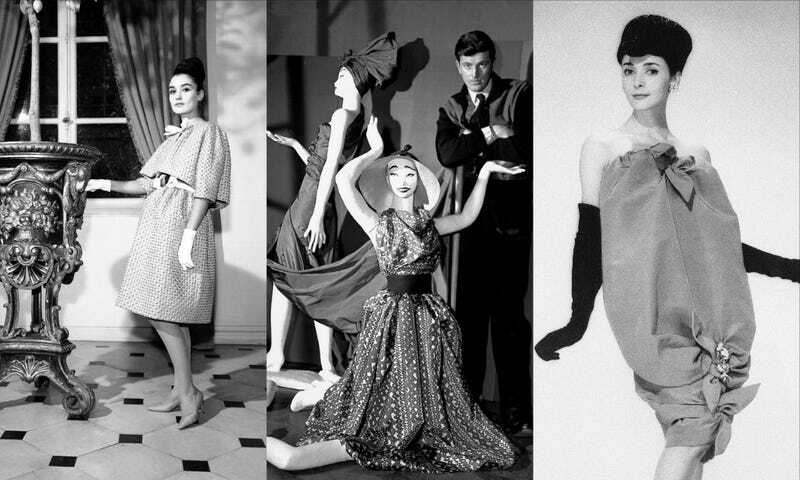 Givenchy met Hepburn in 1953 on the set of Sabrina and dressed her for Funny Face and How To Steal a Million in the slim sheath dresses and feminine suits that would become his trademark. Hepburn was reportedly the muse for Givenchy’s fragrance L’Interdit, which was created especially for her. The exquisitely simple tailoring Givenchy was known for also caught the eye of Jacqueline Onassis, who wore Givenchy almost exclusively in her White House years. The pillbox hats, the shift dresses, and the low pumps that defined her look and inspired hundreds of other women to follow in her stead, including various American socialites of a certain vintage and Queen Elizabeth II. In 1988, Givenchy sold his couture house to fashion conglomerate LVMH Moët Hennessy Louis Vuitton; he remained in charge of the brand for another seven years until retiring in full in 1995. John Galliano, Alexander McQueen and Julien McDonald all took a turn at the helm, but the label made waves once again when guided by the occasionally problematic fave Ricardo Tisci, who left the brand in 2017 after 12 years. Tisci’s goth sensibility served him well (with some mishaps), imbuing a classic line with a new, fresh point of view that wasn’t always conventional but memorable just the same. “I’m so reckless when I rock my Givenchy dress,” rapped Beyoncé, who has worn a Tisci for Givenchy creation to the Met Gala for five years in a row. “Hubert de Givenchy was a symbol of Parisian elegance for more than half a century,” his label said in a statement. “He was the first creator to launch a luxury ready-to-wear range. He revolutionised international fashion in creating the timeless looks for Audrey Hepburn, his friend and muse for more than 40 years.” Tisci continued that tradition, and Claire Waight Keller, the first female creative director for the house in its history, is doing the same. Givenchy is survived by his partner, Philippe Venet, and his nieces, nephews, and their children.